Let´s be bionic! 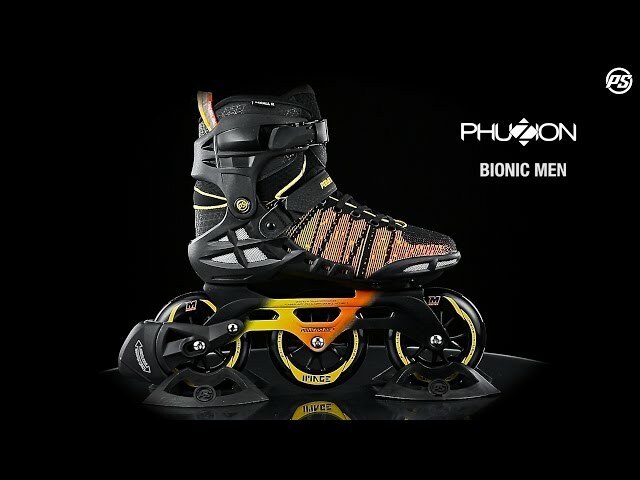 The Powerslide Phuzion Bionic Men fitness inline skate is a must have softboot for fitness enthusiast & skaters who are looking for something special with its stylish knitted textile upper designs & 3 big wheels. This lightweight Triskate is equipped with fast & long lasting 110mm Matter wheels, the No. 1 racing wheel brand. The Bionic skate scores with great fit, super performance & a height adjustable brake. It´s the perfect skate for training & cruising! Why walk when you can fly? Be free and enjoy your city with our Phuzion Fitness Inline Skates. Great performance at unmatched comfort fade seamlessly into each other like the beautiful colors of our high quality knitted upper materials. These 3 wheel skates will make you roll fast, agile and easy. Both women and men skates come with a hight adjustable brake system, so safety is guaranteed. If you are looking for a sporty, comfortable and lightweight softboot skating experience, the Phuzion Triskates are your perfect choice!